Kahu (spiritual guide/guardian, minister) Wendell Kalanikapuaenui Silva has served as the executive director and senior minister of the Aloha O Kalani Ministry for 12 years but as a devoted servant of Ke Akua (God), has followed a spiritual path for most of his adult life and initially, for many years as an independent minister. He walks in the footsteps of his great-grandfather, who co-founded the Christian Ho`omana Na`auao Church in 1901 in Honolulu. How Are Kahu Silva’s Blessings Unique? All blessings are highly personalized, extremely thorough and YOU will be an important part of it. 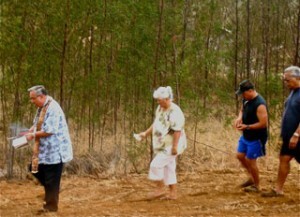 There are many different types of Hawaiian blessing rituals and prayers that are appropriate for the many different reasons blessings are needed including: demolition prior to new home construction, groundbreaking prior to laying the foundation, moving into a brand new home or into a previously occupied home, to perform a cleansing and yes, Kahu has encountered energy which have been negative and which have manifested as various types of ghostly entities, apparitions and spirits. Kahu is highly trained in each specific blessing ritual and prayer but in order to properly prepare, the first question we’ll ask is, “What is your reason for the blessing?” Is your home previously occupied? Does it have a history of pilikia (trouble)? Do you feel uncomfortable there? Have strange things happened? The reason we ask questions such as these is because sometimes it’s not a house “problem” but a spiritual problem with a person who lives there. Kahu will ask certain individuals who are most significant to the home – the owners or residents – to assist him because it is very important for them to also bring their positive energy and blessing to their home. 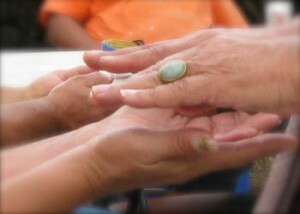 He will ask to bless their hands first because they may be holding the sacred and blessed ceremonial elements – Holy water, Hawaiian salt and ti leaves. Also in every blessing, Kahu includes either literally or symbolically as the site may permit or as appropriate, all of nature’s elements essential to life and to man: earth, air, fire and water. Why Should We Have Our Home Blessed? It’s a custom in many cultures in Hawai`i. IKahu’s main purpose for asking Ke Akua’s blessings is to bring positive energy and that means many things: To make your home the tranquil sanctuary that every home should be, to foster a positive and balanced environment, to ask for protection and safety for the residents and all who live in and enter your home, to embrace with warmth, a sense of peace and comfort, to gain the ability for all the ohana (family) members to live and work together in harmony united in one thought, in one heart and in one spirit, with happiness and unconditional aloha for one another, to create an atmosphere of kindness, compassion and respect toward one another and to create “nest” for sharing, inspiration, discovery, creativity and growth. This is called PONO (GOOD ENERGY). YOU will play a significant part in creating PONO and YOU are responsible for maintaining PONO when Kahu leaves. How Do We Prepare & What Should We Expect? Kahu Silva asks that all present come with aloha and a positive mind, heart and spirit. When Kahu arrives for the blessing, he’ll explain what is to happen, how you’ll assist him and answer your questions, if any, so you’ll know exactly what to expect. Ideally, primary residents should participate because it is important to bring their positive energy and blessing but children who are in school may be excused. Kahu may use a blending of Holy Water that has been collected on a sacred night, from sacred sites perhaps from the Holy Land (Lourdes, River Jordon, Fatima) or the most sacred sites from several of our islands. May We Ask Questions During the Blessing? 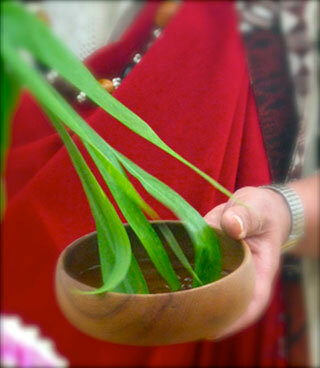 As Kahu blesses each room you may hear his prayers in Hawaiian, English and Portuguese languages. During this time, Kahu is deeply concentrating, extremely focused and so in tune to the spiritual realm that he’s almost oblivious to the material world. So spiritually connected to the energy of the universe during the entire period and following the forces and guidance from the cosmos, Kahu is constantly and keenly sensing things that may have happened in the past, present or future. Kahu will probably not speak until finished and would appreciate quiet – noise, conversation or people moving about should be kept to an absolute minimum to prevent distraction, breaks in his concentration and more important, in his divine connection to God. Why Does Kahu Ask Permission to Use Incense? This is the most important tool that Kahu uses to detect positive and negative energy – he can’t explain why and how it works. The special mixture of sacred natural elements among them maile, that Kahu uses to make the incense also perfumes the home to make it ready for the occupants. 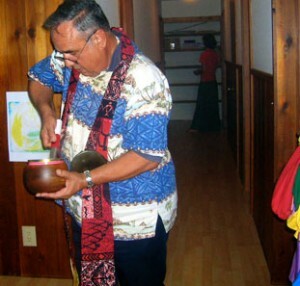 Kahu burns the incense in a small container as he performs the blessing like a priest uses during mass – no danger involved. If you have sensitive smoke detectors or prefer him not to use it, please let us know. Kahu says the smoke “talks” to him and all who are present will obviously see the unique way the smoke behaves curling into shapes that only Kahu can interpret. We know of no other individual who uses or interprets the smoke as Kahu does telling him what has happened in that space and what must be done. The most amazing event was when the smoke formed the shape of a woman. Kahu immediately knew what that meant and was easily able to solve a problem. What Other Blessings Has Kahu Performed? Over 25 years, Kahu Silva has performed hundreds of different types of blessings for private individuals, corporations and state, city, and federal government organizations including the Hawai’i State Legislature openings, chambers and offices, the Department of Defense, Department of the Interior, all branches of the military, the American Bar Association, the University of Hawai`i System, the National Memorial Cemetery of the Pacific, the U of H, the public school system, state libraries, Honolulu Police Dept. Hawaiian Airlines, the re-dedication of the Statue of Liberty in New York, during awards ceremonies honoring Ethel and Robert Kennedy, the United Nations International Year of the Older Adult Celebration, motion pictures and television …the list is extensive. He has had the honor of sharing our culture on behalf of the Hawaii state government before several foreign heads of state including the Crown Prince of Japan, His Excellency Zhao Ziyang, Premier of the People’s Republic of China, their Majesties the King and Queen of Nepal, and her Majesty the Queen of Thailand. Kahu is often invited as guest speaker, presenter and lecturer at cultural celebrations nationally and internationally. Hale is the general Hawaiian term for a building, house, or residence. The house is integral to the Hawaiian lifestyle. It provides not only a shelter but is the central gathering place for the family to relate and interact with each other within a communal social and physical environs. More importantly, the home is the heart of the family’s spiritual development or mana (spiritual force). Therefore, prior to the selection of the house site, its design and construction, a kahuna – kuhikuhi pu`uone is consulted. Using a Hawaiian technique similar to the principles of the ancient Chinese Feng Shui, the kuhikuhi pu`uone would advise the owner regarding the proposed site, the house design and construction and would make recommendations as appropriate. Prior to construction, a traditional ground breaking or blessing of the foundation is performed. It is most important the foundation site of the house or building is pono (made right) and appropriate for the design and construction of the structure. Many places in Hawaii have a special spiritual designation or historical significance. In recent times, numerous sacred heiau, (temples), family & mass burial sites, ancient battle grounds, consecrated altars, and spiritual mounds have been uncovered on public and private properties. Once disturbed, Hawaiians believe that the natural and/or spiritual energies of a place need to be made pono or put back in balance. Thus blessings at the beginning of the construction are considered necessary and very important. Following the completion of the house and when it is ready for habitation, a very sacred ceremony is performed by the Kahu. This initial blessing is usually takes place with only the members of the household present who will bestow their mana and blessings in every part of the house and officially take possession of the home. As part of the blessing ancient benevolent guardian spirits are summoned to watch over, protect, and ensure the safety of the residents. 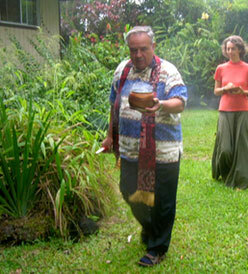 After the blessing, a pa`ina or house warming lunch or dinner is prepared for invited guests. As guests arrive, they are welcomed by their host and invited to enter the house, add their blessings, and partake in the pa`ina feasting and celebration. For the Hawaiian, a house is not just a place to reside in. It becomes a home and takes on a certain distinct character and personal quality usually representative of the family who occupies it. When entering a home, one is said to be able to discern the family’s warmth, hospitality, friendliness, loving embrace or may feel, unwelcomed, pushed, or repulsed by the mana or spiritual energy from without or within. Prior to moving into a previously occupied home, an indepth ceremonial cleansing ritual and blessing was traditionally conducted by the kahuna pule, the high priest, the head of the household and the family. Using ancient Hawaiian prayers and sacred rituals, the family accompanied the kahuna and blessed the house with the traditional sprinkling of the pi kai using the la`i (ti leaves). Blessing for a multi-storied building is similar to that used for a hale. If the building is new, blessings are usually conducted at the ground breaking or prior to pouring the foundation by the construction company. Sometimes there is a “topping off “ blessing and celebration by the owner(s) & workers acknowledging the completion of roof of the building – an important phase in the construction. Upon completion of the building and prior to occupancy, the Kahuna accompanied by the owner(s), representatives of the construction company, and the residents participate in a gala grand opening ceremonial blessing incorporating ancient Hawaiian prayers, chants, the traditional unraveling of the maile lei with its accompanying protocol, music, speeches, a tour of the building and an elaborate hosted welcoming reception. Blessing for a new apartment is similar to the traditional blessing of an existing house and is usually performed with the owners/residents of the unit. The apartment must be materially and spiritually cleansed prior to occupancy and prepared to receive the energies and ambiance reflective of the new resident`s individual personal qualities and lifestyle. Blessing of an office or workplace incorporates the fundamental rituals associated with the blessing of a hale or building. However, the primary difference between the blessings of the hale and the workplace is in the type of prayers offered. In an office or workplace, in addition to the cleansing of the facility, the kahuna prays for the workers to unite in the spirit of “aloha” and fulfill their kuleana (work responsibilities) as a productive and supportive working ohana (family). Primordial Hawaiian guardian spirits are evoked to ensure the safety, protection, and security of everyone in the workplace. As appropriate, the Kahuna may consult with the administration and management and recommend alternatives for consideration to enjoy the prosperity and a successful business enterprise. 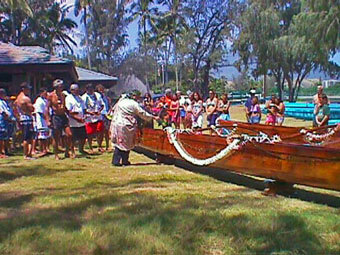 The ceremony of consecrating a new canoe is called lolo `ana i ka wa`a, which translates literally, as imparting “brains” to the canoe. Traditionally, the rites take place at the canoe launching site on the beach. In ancient times an imu (Hawaiian underground oven) was prepared with specific food items that are spiritually significant and the canoe was decorated with ti leaves, maile, ferns and other forest greens. Once adorned, the Kahuna commences a very sacred and dedicatory ritual with ancient prayers specific for the canoe. The imu was uncovered and the Kahuna first takes ceremonial food for the offerings and a feast ensued. Upon completion of the feast, the canoe is launched, and sails to a designated site where the sacred ritual and prayers continue. 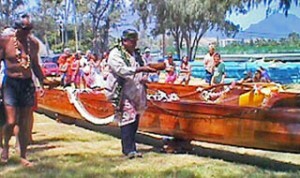 The canoe returns to the shore and is hauled on the sand where closing prayers are offered. The ceremony for consecrating and launching a boat or ship is called lolo `ana i ka moku and is traditionally similar to that used for the blessing of a canoe. Today, the ceremonies for launching of a ship in Hawaii are very seldom held and usually incorporates a blending of the beautiful traditional Hawaiian blessing rituals with a christening ceremony. Ka`a – Cars, Trucks, Trains & Airplanes, etc. Cars, trains, other land and air transportation vehicles are blessed in a similar manner as canoes and seafaring vessels. Is Kahu Affiliated with a Church? Kahu Silva has been on a spiritual path for most of his adult life as an independent minister for several years but since itʻs incorporation in 2000, he has served as the senior Kahu of the Aloha O Kalani Ministry (AOK) (Non-profit 501c3, tax-exempt). 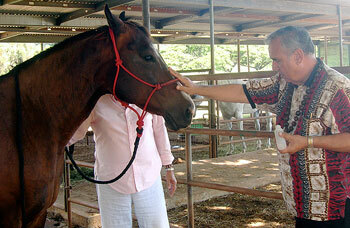 AOK is a small Hawaiian non-denominational ministry whose practice is more spiritual in nature rather than religious. More universal in thought, people of all beliefs are welcome. A church “without walls,” AOK activities include outreach services and performing unique Hawaiian ceremonies including Ho`ola`a (baby dedication blessings), business or home blessings, and Ho`oman`oana (memorial services). How Do I Schedule a Blessing? Due to Kahu Silva’s extremely demanding and limited schedule of back-to-back ministry, business and employment obligations 7 days and 5 evenings per week, blessings are scheduled Monday thru Thursday only in the areas and times indicated below on the Schedule of Availability. There may be a wait of 2-weeks or more. How Long is the Blessing? The duration of blessing varies depending on the actual size of the space and other factors. Generally, the larger the area or things to be blessed, the longer it will take but for the blessing. Kahu likes to allocate about an hour from arrival to departure for a blessing. We can’t stress enough that Kahu always has another commitment immediately following so if you make an appointment and can’t make it or are subject to a delay, please notify Kahu immediately. A more accurate time can only be determined by your specific location. No! Kahu Silva always performs his blessings in the spirit of aloha and never asks for anything in return but, expressing one’s gratitude is customary. Kahu prefers to have our clients place their own value on God’s blessings and give whatever they feel from their heart. Please complete our contact form and be as specific as possible with your name, proposed date, phone, address and reason(s) for the blessing.